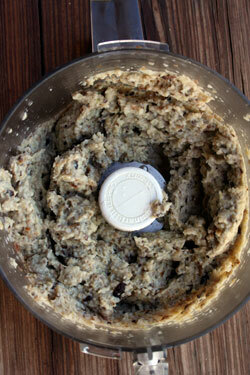 Place the eggplant, mushrooms, olive oil, lemon juice, and garlic in a food processor or blender. Process until the ingredients are blended but not to a smooth paste (a few little chunks are good). Transfer the dip to a serving bowl and add salt and pepper to taste. Garnish the dip with the cilantro. Serve the dip warm or at room temperature with tortilla chips or smeared on top of small rounds of toasted bread.